LOOK what we got for the asking! 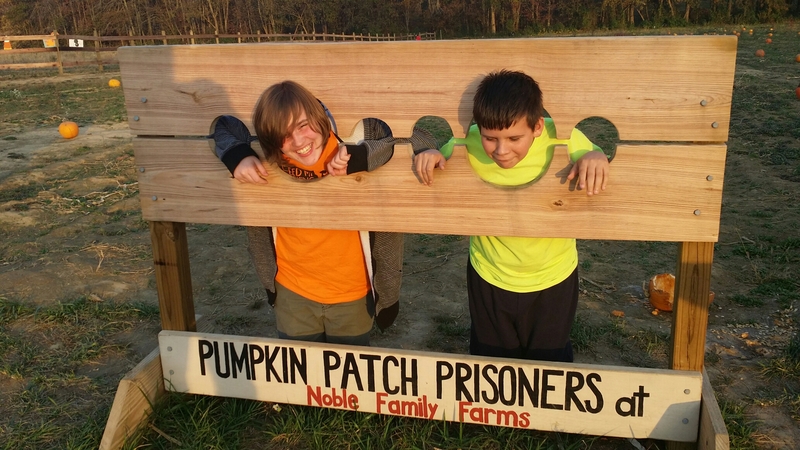 When we were at Noble Family Farm the other day, I asked the owner what she did with all of the leftover pumpkins once their season ended. She told me that they till them under back into the field. I asked her if I could have some of them once she was finished for the season, and she told me to bring back my truck and trailer and load up everything left in the field if I wanted it! I lined up Johnny and Thomas to come and help me, and last week on Tuesday evening, Johnny, Thomas, Jake, and I drove back down there and started loading up the truck. 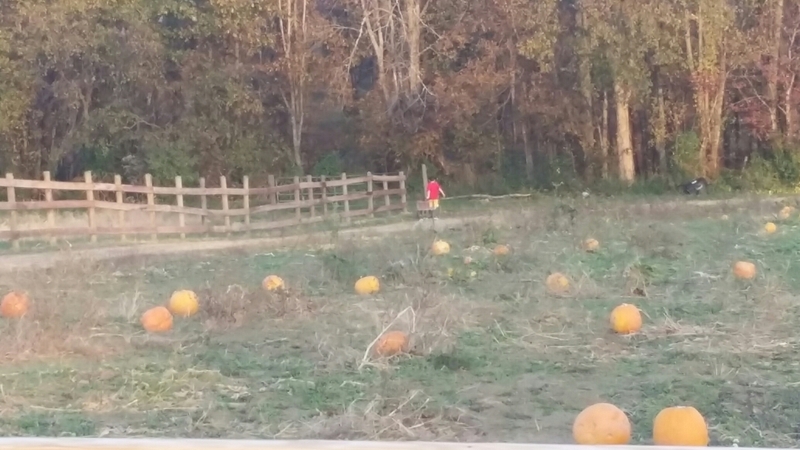 We figured out how to sort of divide the field into a grid and used the farm’s wagons to pick up all the pumpkins in one grid and leave only the bad ones on the ground. Then we pulled the wagons off to one side or the other to make room for my truck to drive right down through the field. Jake went over in the area where the apple slingshots were and started picking up apples off the ground into his wagon, but he yelled after a few minutes that there were bees everywhere so I told him to just forget about the apples. We had unseasonably 80-degree weather that day, and all of the bees seemed to come back out and go everywhere. I’m hoping to go back down one evening this week when it’s much chillier to get apples out of that field, but I figure the deer will probably eat most of them before then. 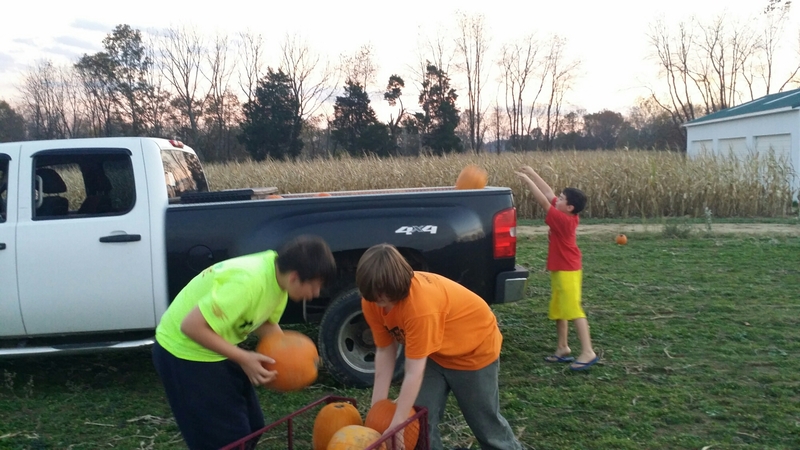 I think we loaded pumpkins for about two hours! At any rate, it was dark as we were leaving, and then I took a wrong turn twice heading home in the dark little tiny gravel roads, so it was almost 9 o’clock by the time we got back. The boys all said I completely wore them out! I paid them with McDonald’s because that was what they wanted. They were cheap but hard workers! 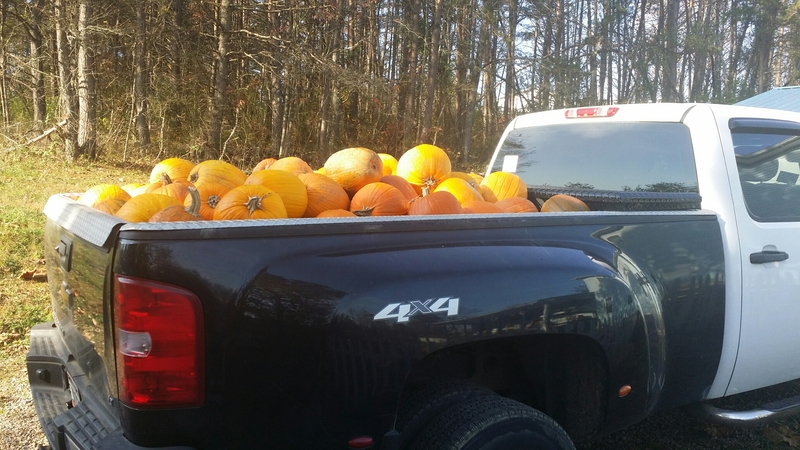 I couldn’t believe that I got all these pumpkins for free! I texted the owner and told her to let me know when she’ll be in town because I’m going to give her some pork chops and bratwurst in exchange for all those pumpkins. I thought it was really sweet of her to let me do that. This just goes to show, folks, that it really doesn’t hurt to ask to get waste stream produce for your farm. The worst the other person can do is say no. The best the other person can do is say yes! I’m totally putting this down as a Martha Stewart moment for my Year of Martha! 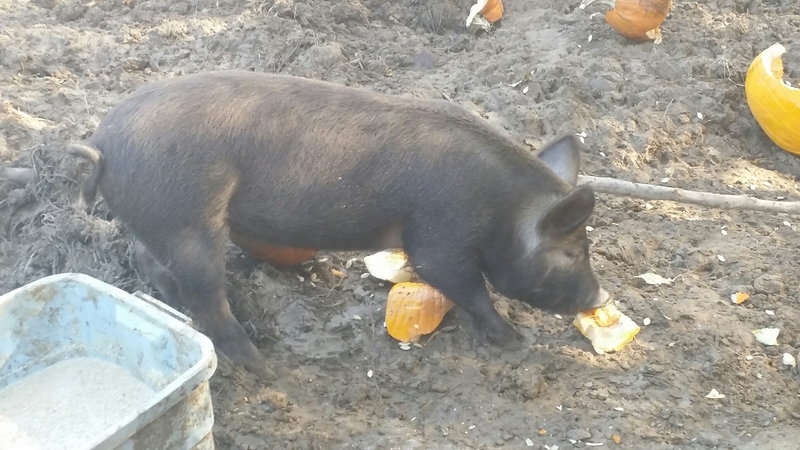 I successfully repurposed pumpkins originally sold or house decorating and jack-o-lanterns into pig, chicken, and cattle supplemental feed!